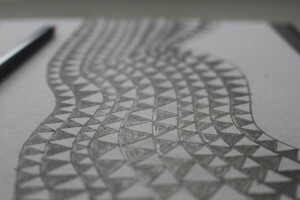 I decided to award myself a little bit of time off this afternoon to do some doodling with triangles. I think I mentioned a few weeks ago that I’d been thinking about triangles…. well, I’ve continued to think but haven’t had time to get anything down on paper. Off to the left you can see the pencil I used. This is a Palomino Blackwing 602. Last month my husband gave me a box of 12 of these pencils which he’d bought in a shop in Ladbroke Grove in London where he was told they were the best pencils in the world. I have been so busy with work since then that I haven’t had the time to even try them out till now. I’ve just been looking up some of the fulsome praise for them on the internet, and they certainly have lots of fans. And I have to say it’s beautiful pencil – a very smooth, very black line, and it seems to hold its point for quite a long time. Best in the world? 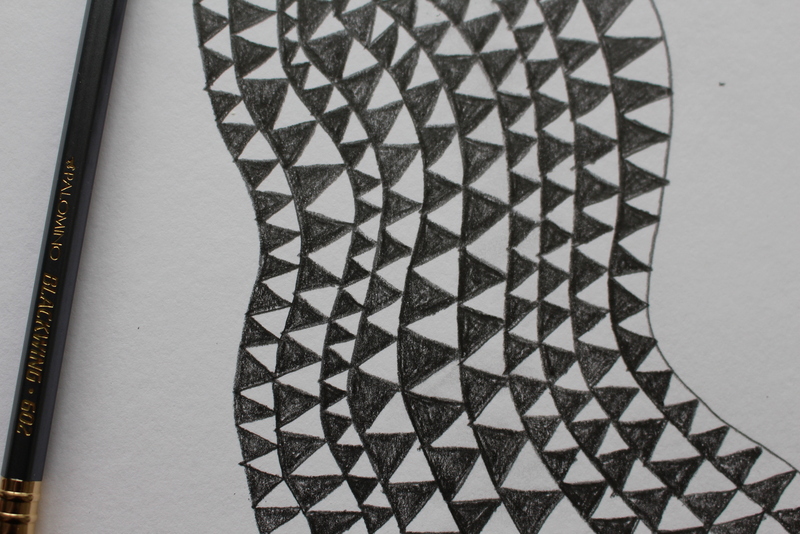 I wouldn’t like to say unless I’d tried all the pencils in the world, but it’s pretty good. 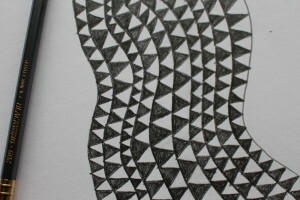 I have plans to do some more sketchbook work on triangles. Will I ever get it done? Watch this space…. I’m disappointed. In April I wrote a post about my entry for the Carrefour Européen du Patchwork. Well, I’ve done quite a lot of work on it, and I’m pleased with it, but unfortunately I’m not going to get it finished for the 26 June deadline. There are two main reasons for this: first, I chose to handquilt the piece and it’s taking a very long time indeed. Second, I’ve been inundated with work. The work will diminish towards the end of the month, but that’s too late. So, what have I learned? The theme for the CE du Patchwork was announced in March, and if you have what is pretty much a full time job then you’re not going to have time to handquilt a fairly substantial piece of work in 3 months. If I do this again I’ll have to take this factor into account much more carefully in planning the work. Also, I probably spent a bit too much time in sampling; perhaps I could have compressed this into a shorter period to allow more time for the making (although I think it’s risky to skimp on sampling time). Finally, I think I’ve learned that I’m going to have to plan ahead much more carefully so that I can achieve what is possible. And what is possible, frankly, may not be much at all given that I have to earn a living. I’m feeling rather despondent about all of this. There seems to be so little time to do the things I want to do. Mostly, I’m quite stoical about the need to work and earn cash. At one stage in my life, as I saw people a few years older than me taking early retirement at not much more than 50 years old, I hoped that I’d be able to knock off work while I was still young enough to enjoy myself. However, early retirement is no longer a reality for most of us, and we’ve just got to accept that. It’s going to be even more difficult for our children’s generation. So what to do? Well, I think the objective has to be to establish some kind of balance between working for a living and doing the things I want to do. I do too much of the former and not enough of the latter. I’ve been talking about this for years, but have made little progress in achieving the balance. I keep thinking that once I get through my current workload then I’ll sit down and reappraise things and try to achieve some of that elusive balance. Trouble is, I never actually get to the end of my current workload. I’m a hamster in a wheel… going far too fast in apparently perpetual motion. Sigh. I thought I’d just write a very brief post today in praise of the iPad. I’ve been using a PC for many long years; I was quite an early adopter of the technology so I’ve accompanied Microsoft through a huge range of software innovations. In the early days I was quite the enthusiast for both hardware and software and was not averse to fiddling around with the inside of the machine to install extra memory, new video cards and so on. Like many other PC users, I’ve patiently (well, more or less patiently) coped with software that didn’t really work properly, spent hours on unhelpful helplines, reinstalled crashed operating systems, shelled out extra cash for virus software and so on. Although, for years, I’ve admired the Apple range of products from afar for their outstanding design I haven’t actually invested in any until very recently. But last year I had to replace my phone and decided to go for an iPhone. 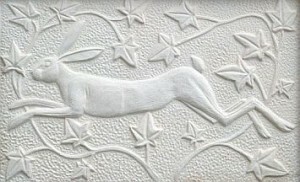 I was impressed by the sheer beauty of the object but even more so by its user-friendliness. You switch it on and then… well, it just works. So I suppose I was softened up for the latest Apple addition, an iPad Air bought just over a month ago. Well, in short, it’s fantastic. After buying it I spent a few minutes in the Apple store being instructed by a friendly employee in how to set it up. That’s all it took. I got home, switched it on and found it instantly recognised our wi-fi (not all devices do) and off I went. 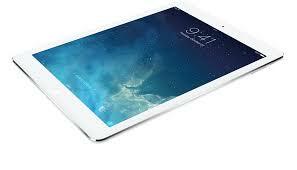 The downside to the iPad Air, and indeed to other Apple products, is the price. I realise how fortunate I am to be able to afford to make the investment in this technology. But the product really is excellent and I don’t feel so bad about the hefty price of it now. I use it every day…. Actually, that wasn’t such a brief post, was it? I’d better stop burbling on and get back to work. I don’t often get any response or comments to these posts, and it’s very gratifying when I do. My friend Laura emailed me the other day to say she’d been looking at my pictures of textured walls (these are featured under the ‘Architectural Ornament’ heading on my ‘Inspiration’ tab). 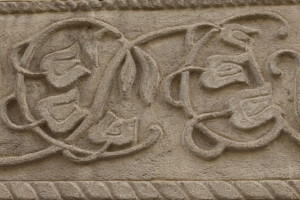 Laura identifies the correct word for plaster ornamentation of this type as ‘pargeting’. 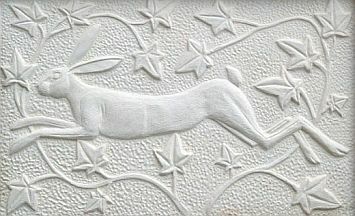 Occasionally in the UK you come across the surname ‘Pargeter’ which indicates that somewhere in that person’s ancestry is a person who specialised in plaster ornament. It’s such a lovely word – right up there with gusset, pejorative and flange which are some of my favourite words. 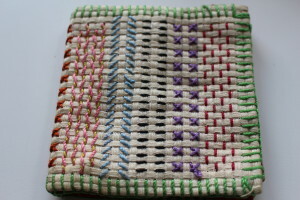 It’s the first piece of sewing that I remember finishing – a needlecase. 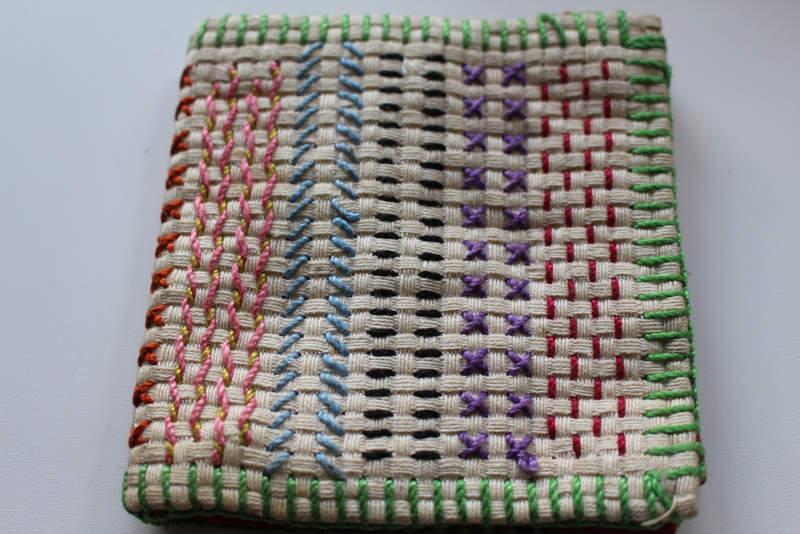 When I was in the first year at junior school (in the English school system at the time you started in infant school at age 4-5, then moved on to junior school at age 7), and was therefore 7, everyone had to do needlework. This included all the tough, scary, boys who tended not to like it one little bit. In fact, as far as I remember, I was unusual amongst both girls and boys in actually enjoying this activity. Class sizes were large in those days, and Mrs Howe, our class teacher kept an iron control over 40 of us, even in needlework lessons which were a natural cue for rebellion in the ranks. Materials were very carefully controlled and we were not allowed free access to them. The way it worked was this: everyone in the class was issued with their little bit of Aida fabric, then you had to queue up at the teacher’s desk. You were allowed to choose a colour you liked from the box of cotton perlé in front of Mrs Howe, then she carefully cut off a length of thread and started the line of sewing off for you. You then went back to your desk (serried ranks of desks all facing the front) to complete the row. When you’d finished, or if you needed help with it, you joined the queue again to see Mrs Howe. She carefully judged each piece of thread issued to a child so that once the row of sewing was finished there was only the tiniest piece of thread left over. She would then secure this at the back for you , and trim off the half inch or so that was left over. All this was done with the strictest regard for economy. Mrs Howe was of an age to have been through shortages and rationing during the war and the attitudes such experiences engendered were still clearly current many years later in the schools system. This system ensured that only one pair of scissors was required in the classroom, and these were under the control of Mrs H. Quite right too. You wouldn’t want the tough boys getting hold of scissors. Looking back, I really appreciated the control and order that existed in the classrooms then. I’ve been into infant and junior classrooms more recently, and it’s a lot different now. But I think the old way was better for some children – those who tended to be fearful and/or introverted. Of course, there was only one Mrs Howe, and forty of us, so I think you can probably spot the flaw in the system: if you were quick at sewing you spent virtually all the time standing in the queue waiting to see the teacher. But oddly, this whole experience confirmed a view that I had already formed, i.e. that I very much liked sewing. A few years ago I made myself another needlecase and stopped using this one. But it’s one of my most treasured possessions, and I love it’s clunky choice of colours and its various mistakes. You can see that one of the ends has come undone in the purple cross stitch (maybe Mrs Howe was being a bit too economical) and the blanket stitch around the edge is a bit wonky in places. I still love it and I often think of Mrs Howe, who is presumably long gone, when I fasten off a loose end. 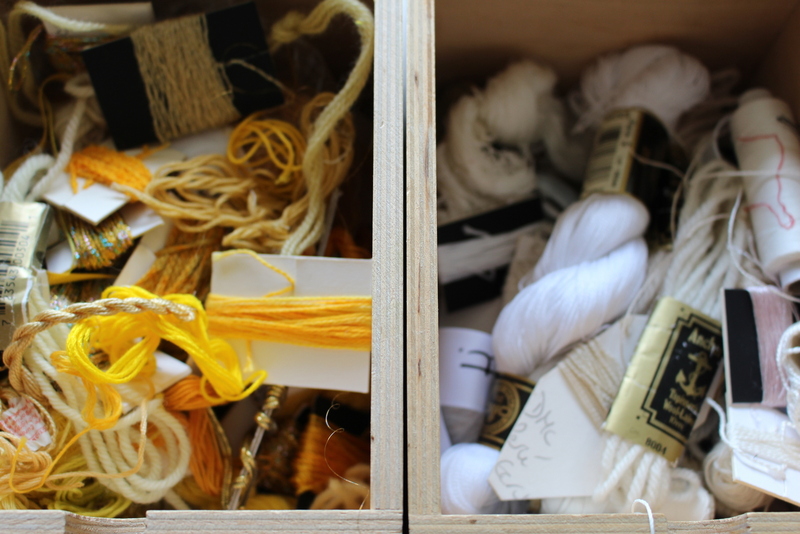 Keeping threads tidy is quite a challenge once you’ve built up a collection. Their natural tendency is to turn into a tangled mess as soon as your back’s turned. 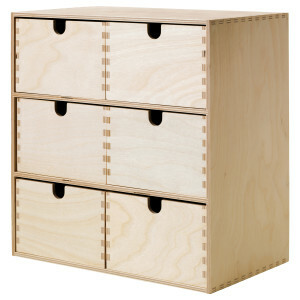 I keep them in a series of plain IKEA wooden drawers (see photo below for example). This type of unit is compact enough to keep on a windowsill or desk, without getting too much in the way. I see from Wikipedia that IKEA now has stores in 40 countries, and it’s a very useful resource for really cheap storage. 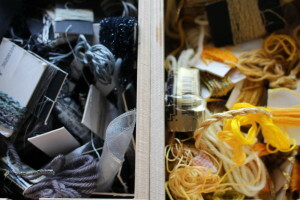 A couple of months ago I spent a happy Sunday afternoon organising my threads by colour (what it is to be an obsessive) into about sixteen drawers, as in the examples here. I find this system works well for me, although it doesn’t stop the threads from tangling themselves up as soon as the drawer is closed. 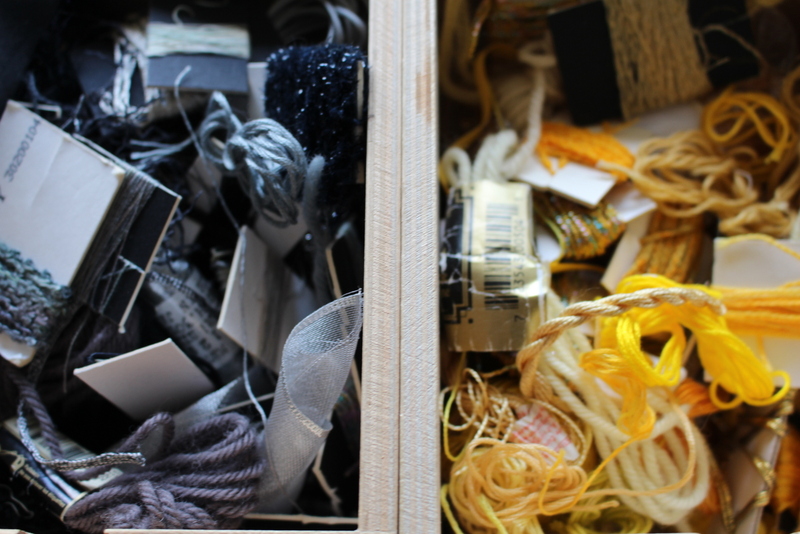 On the whole I like to have lots of threads to choose from, although as always, too much choice can be a bad thing….. Some of my thread collection goes back many years to childhood, and even beyond. 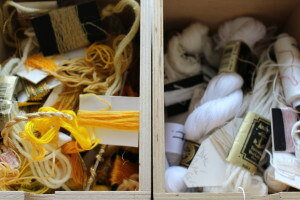 Many years ago a friend of mine at university was left a couple of boxes of threads by her grandmother. Being not remotely interested in stitching herself, she kindly passed them on to me, and I am still using them, many years later, and even more years since they were first acquired. They don’t seem to me to wear out or to become weaker with age, although I know that some people say they do. So I’ll carry on using them, pleased that they are being used maybe half a century later. If you click on the ‘Inspiration’ menu tab, you’ll find a new inspiration page: architectural ornament. I’ve had these photos stored for the last three months, intending to edit them and put them into a gallery for the website, but I’ve only just got round to doing it. I went out with my camera one day into the streets of a little town in the French Pyrenees, intending to look for ornament, and found straight away that I was spoiled for choice as there’s just so much of it. As I note on the page itself, the houses which have these ornamental features are mostly quite small and poor, but their builders obviously felt it was worth the effort to make them individual by use of ornament. This is just a selection of the photos I took inside half an hour. There are some striking shapes, textures and colours in there. If you feel inspired by any of the images, well, get to work! The NextGen Gallery software I use has a range of possibilities for displaying photos, and I’m trying out a new one on the inspiration pages. I think I rather like it. I may try out some of the others so if the appearance of various pages changes from time to time, that’s why. Just me having a bit of a play. I’ve plans for at least one more inspiration gallery and I think I’ll try to do it soon. If I leave it for any length of time I’ll forget how to do it, and will have to learn it all over again. Which is what happened this afternoon.